A small gouge straddling two of space shuttle Endeavour’s heat shield tiles was not expected to be a concern but required astronauts to capture close-up imagery for analysis. The focused inspection was performed on May 21, 2011. Space shuttle Endeavour's heat shield has been deemed safe for the ship's last landing thanks to imagery taken by its astronauts and sent down for study on Saturday. "We're essentially clearing the vehicle for reentry at this point," said NASA's shuttle mission management team chair, LeRoy Cain. Fuzzy photos of the seventh gouge, which straddled two thermal protection system (TPS) tiles, couldn't be analyzed to the same degree, so the shuttle astronauts were tasked with using cameras and sensors mounted at the end of a robotic arm inspection boom to get a close-up look at the site early on Saturday morning. The ding is 2.43 inches (6.17 cm) by 2.95 inches (7.49 cm) wide, and 0.89 inches (2.26 cm) deep. By Saturday afternoon, imagery and tile experts at NASA's Johnson Space Center in Houston had processed the newly-downlinked data, even creating a physical 3D model of the divot. 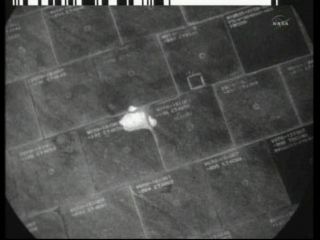 "With the data, to include the laser data that the team was able to acquire from the focused inspection, the analyses team went back and essentially what they did was verify how much tile was still in the cavity, because of course it is more important what remains than it is what is gone," said Cain. "What we're interested in is protecting the structure underneath the tile and the associated systems." "So with that we've cleared the TPS," said Cain. "The vehicle is otherwise in great shape as well. It continues to perform outstanding." You can follow Robert Pearlman @robertpearlman. Follow SPACE.com for the latest in space science and exploration news on Twitter @Spacedotcomand on Facebook.